A granite countertop not only provides a touch of elegence to any home but also adds great functionality to every kitchen. Before you decide on a design, it is best to know a few useful information that will help you choose which specifications to apply on your countertop. Moreover, should you intend to ask us for a quotation for your requirements, we will, most likely, ask you certain questions to clarify some details. Referring to this article should help you greatly. The Frontage, the main part of a countertop, is where kitchen preparations are made. It can either be a continuous space or two or more slabs joined together in angled corners. A width of 0.60 meter is required to ensure that there is enough usable space to work on. In addition, it will allow you to have an adequate area to accommodate the sink, cooktop, and other small kitchen accessories. (b.) to protect the wall with a splatter-proof surface. Because there is no standard specification for splashboards, you can choose from a height of 4″ all the way up to the upper cabinets. It all depends on what you want for your kitchen. The Riser (Apron), on the other hand, covers the supporting concrete or plywood. 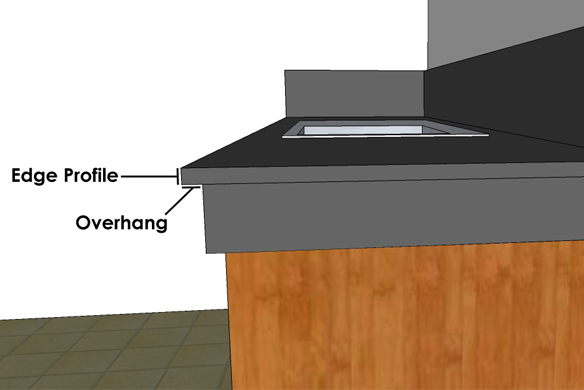 It is placed around the edges of the countertop, and hangs between the frontage and the cabinet doors. 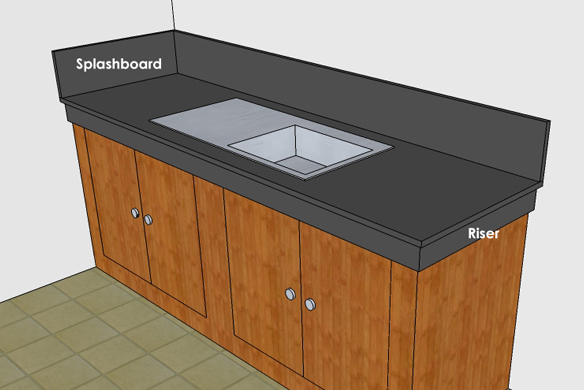 Some kitchens have drawer blanks in front of sinks and cooktops; the riser replaces the need for these blanks and continue the line of granite that comprise your countertop. Apart from choosing the right granite color, getting the perfect Edge Profile is equally important. It is a design element which affects the look and feel of the countertop, as well as the whole kitchen. An Eased edge is a simple and elegant design which fits any modern or vintage kitchen. The Bullnose, on the other hand, is a rounded edge detail perfect homes with kids whose heads are about counter height. The standard designs, however, are not limited to having flat or rounded edges. The flexibility of granite extends to limitless edge profiles. You can even create your own. Should you need a reference on the basic profiles, feel free to click this link. This entry was posted in Fabrication & Installation and tagged Anatomy, Apron, Balintawak, Counter Top, Countertop, Edge, Fascia, Metro Manila, Overhang, Parts, Philippines, Profile, Quezon City, Riser, Skirt, Splashboard by saintmarkcs. Bookmark the permalink.